I first learned about the Children of the Jaguar when I wanted a free plane ticket to Europe. Although I'd never been to the Amazon, I somehow convinced a film festival to let me speak on the importance of the Amazon in relation to climate change and indigenous people's rights. Cardinal rule number one: always Jump at an opportunity before you have time to think your way out of it. You never know where it's going to lead you. Cardinal side note: I consider myself extremely lucky and I’m grateful everyday to be in a position where I get the rare opportunities that being an actor provides me. Really it was the idea of riding my now non existent motorcycle through the Amazonian jungles which led me to this point. Me and five friends started out in Vancouver BC and rode our Harley Davidson’s all the way to Medellin, Colombia where the Sportster engine finally broke needed to be replaced. So we did what every true cowboy would do. Ditched our bikes and headed south. Our goal: Patagonia. Our bikes: Non existent. After a five hour car ride from Quito me and my now two buds, Nik and Drew, were greeted by a beautiful young indigenous woman, Nina, who divides her time between the Sarayaku community in the Amazon and her schooling in Sweden where she's studying human rights. I call her a woman at 23, because this is what I would define a woman as: Her concern is her community and Her priority is protecting the Sarayaku community and their fight against the encroaching oil exploitation and corrupt politics to protect the rights of her people. I know many of you may be saying, this all sounds a lot like Avatar. And that’s because it is. I know I’ll get a lot of cringes for that comment but movies really help us Gringos understand complicated issues like this from a distance. Thank you James Cameron. I chartered a twin engine Cessna for an hour deep into the Amazon. Drew, Nik, and our now our new member Nina. The plane sputtered along the edge of the Amazon, or as the indigenous call it, the heart and lungs of the planet. The indigenous people represent only four per cent of the world's population, but their territories hold eighty per cent of the earth's biodiversity. Theres a lot of facts to throw around here about species and sacred land and watersheds but to throw it all into a nut shell: the Amazon is really the only thing really fighting the fight against global warming. It's ability to absorb the worlds CO2 emissions is the only thing keeping us from the global temperature increase. In fact, last year, the International Energy Agency issued a report stating that two thirds of all fossil fuel reserves have to remain underground if we want to stay below a two degree Celcius temperature increase. So by now you must be asking what this has to do with motorcycles? Well you must be thinking... They use gasoline. A few years ago I met Atossa Soltani, the founder of Amazon Watch at the RYOT office and told her about the motorcycle trip and my interest in visiting the Sarayaku Community. She asked me bluntly if I could please ride an electric motorcycle. The conservationist in me probably would have preferred that, but with the present charging technology it would have turned into a fifteen year road trip. This is all changing now. Fortunate enough for us hypocrites, we got the opportunity to see a Utopian community that has almost no carbon footprint and lives almost completely off of what they call "The Living Forest". Nina cleared it with the elders and community for us three to enter their village for the next three days while we kicked mud waiting around for our non existent Patagonia motorcycles to appear out of nowhere. From above 10,000 feet I could see the River snaking through the thick green Brush. And wherever I could see a road, everywhere around it was almost always destroyed. Which is another reason the indigenous are fighting the option of hydro power and the building of dams. We need roads to build the dams and roads equal deforestation. We dipped down into Sarayaku and I could see over twenty, what looked like, war canoes all lined up in the river full of indigenous fishermen. We were greeted on the runway by the Chief Elder, Don Sabino, 96, who comes from a lineage of the most powerful Incan shamans. Nina would walk away everytime I would talk about magic. Or Ayhuasca. Or shamans. Or spirits. Or the giant fenced off 'tree of life' in the center of the village that she said was something kinda like garlic. It was good for you to take with the native tea Guayusa in the mornings. All the fun stuff I wanted to talk about was all the stuff she didn't want to talk about. She’s very protective of her people’s song or wisdom. And she has every right to be. The only way I could relate to it was in the same way people that want to know what its like working with Tom Cruise. Nina’s grandmother, and Don Sabino's wife, Corina is a mother to over 80 blood and non blood children. She gave us a warm motherly hug. I think she was entertained by our “gringo antics" but more importantly had a crush on my Croatian Viking friend Nik and all of his 'tribal tattoos'. I wanted to ask her so many questions about their rituals and myth. But I could barely speak spanish, let alone their native tongue of Kichwa. Nina grabbed us and threw us into a canoe as we waved goodbye to the pilot "see you in three days" Drew yelled. Up the Rapids we roared in a sweaty dusk aboard a motorized wooden canoe. Nina's cousins were covered in tribal paint as one handed us spears and nets and the other scanned the edges of the brown river. "What's going on?" I said pulling up my jeans. "This is how we eat. We fish. Once or twice a year we stuff the rivers full of a special root which makes the fish what you would call drunk and swim up to the surface"
"Where's this root?"? Chortled Drew. We stopped a few times to push the canoe through the shallows. I looked to Nik. I could see him thinking 'what the hell have you gotten me into this time’. I just laughed. Spearfishing with the Children of the Jaguar. I've got this. Nik isn't much of a water guy nor has he ever caught a fish so I assume he'll hold the fish basket. I've been a Spearfisherman for the past seven years, so I was in adventure heaven. Five minutes in, I stepped on a spiny fish and my foot started gushing blood. "Are these fish poisonous Nina"
"If you step on it it is." "turns your foot blue and swollen. Why?" "Nothing. Just gonna let Nik fish for a bit." Handing Nik the spear I bit my tongue, jumping up and down dodging mosquitos and wrapping a bandana around my foot to stop the bleeding. Nik looked over. "You okay?" "Yup, alllllll good over here"
The jaguar cousin was hauling in giant fish I don't think even existed in the encyclopedia britannica. Part catfish, part duck. Part scaled, part snake skin. Nik wasn't combing the river longer than ten minutes before he pulled out a beautiful black plated fish with the nose of a pterodactyl. "What the hell is that" I said super envious. "It's a fish that descends from the Paleolithic era." "Well that is awesome. I'm about to turn into a blueberry. And Niks now a dinosaur hunter"
We all had a good laugh and cheer back to the smokey thatched huts at sundown. No electricity or the comfort of light bulbs here. The Stars came out. The banana leaf wrapped fish smoked away on the coals. Baby alligators scurried amongst the chickens. Children giggled and chased dogs. No one spoke. Just grinned from their almond eyes. And watched us as we watched them with awe. Women cleaned. Men rested from a full day of hunting as we tried to figure out our place amongst their Pandorian world. I think for the first time in a very long time, I was content. My foot was forming three different shades of circular blue from the poisonous fish I had stepped on. Niks in the corner scratching his inflated foot and a recent discovery that he's allergic to mosquitos. After Guayusa tea by the smoky fire, we motored up the river, machetes in hand, to collect palms for a new house being built in the community. It wasn't till my third bundle of selective cutting, when I swung my hand into my blade, cutting me to the bone. I looked inside. It didn't even hurt. So that's what my bone looks like. And then a watershed of red started flowing down my hand dropping like rain on the palm fronds. "Is this gonna be a daily thing?” she looked at me. "Come with me"
She walked me over to a small green plant on the ground and told me to chew it's leaves. I went to grab the leaf. "Not that one. This one. This one can kill you. This one cures that one and this one will stitch up your little scratch". I chewed away at the plant. No wonder they call it the living forest. They use this place like a pharmacy and know exactly what every plant can do to you. In fact, many of the cures we depend on in our pharmacies are originally extracts from Amazonian Plants. I spat the chewed up leaf into the wedge in my skin and wrapped it up with my bandana. After another hour of collecting palms, we carried the palms to the foundation of the new community house being built. Other community members had dropped off bundles too. By now we had a whole string of giggling kids following us. We strolled by the assembly hall where community leaders were addressing the issues they wanted to focus on this year. Almost everyone showed up, as there were about two hundred Sarayaku in the audience. We introduced ourselves on a microphone run on a generator. I've always been shy speaking in front of people maybe because I've never felt like I cared about show business or other things I had to talk about. Or maybe I'm shy because I don't really feel comfortable in my own skin in America. But I felt different with the Sarayaku. Present. Humbled. "We're honored to be here. To see the way you live. Your traditions. It's refreshing to see truly happy people and a wonderful example of one community working together. You're inspiring beyond words and I'd like to help in any way I can." Nik picked up a small Indian child as Nina translated what I said. When she finished Nik raised his fist in the air like Che and shouted "Fight the good fight!!!" The audience was awkwardly silent. It wasn't until Nina again translated that they burst into applause at Niks war cry. Later that night we ate smoked fish and rice again with a soup that the grandma made. She mischievously asked Nina if I liked it. I didn't mention that it was the worst thing I've ever had, but wanted to know what was in it. She responded 'Fish Pee' and then broke out into toothless laughter. Well It sure tasted like that. 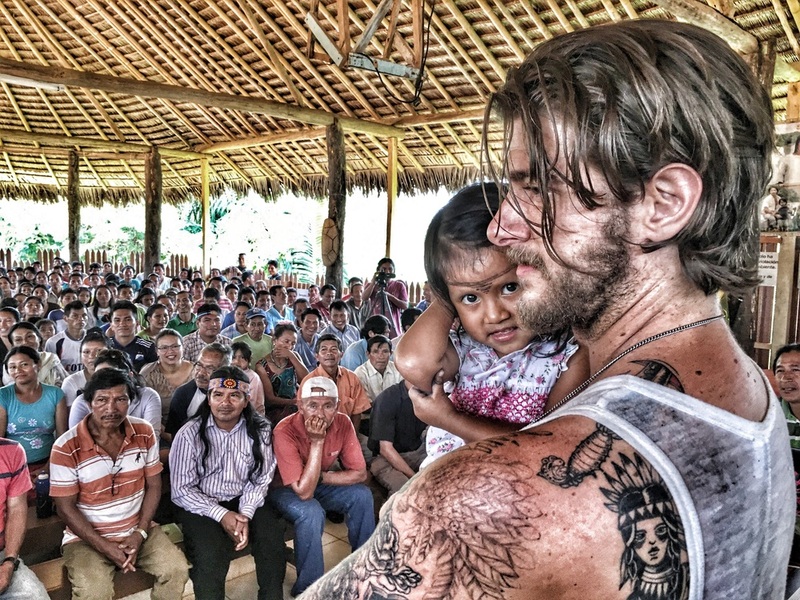 That night Drew took part in an Ayhuasca ceremony with the children of the jaguar. In fact we all took part in it. And even though Nik and I passed on the medicine, we were still tripping. Throughout the night we both saw a dog stroll by with bright yellow glowing fur. Nina later confirmed it was just a fungus that gets on the dog. "Just like the garlic tree?" Nik replied. "Now a glowing mushroom tree?" Luminous shadows and bizarre animal slaughter noises from the deep jungle could be heard amongst Drew quietly vomiting in the corner. "I had a revelation Don!" Drew lousy whispered to Don Sabino. "Im gonna have a baby!" Me and Nik were giggling at pregnant Drew as he was led back to his seat. Don Sabino was so far in another dimension chanting beautifully when he was doing his work on us. I don't understand his work, their medicine, their culture, nor will I pretend to. A lot of unexplainable "magical" occurances happenned. Things that words won't do justice and western medicine can't explain. Like the giant black jaguar cruising by my legs during the demon extraction part. They also found and killed a large poisonous snake that night in the bathing area in the river. Maybe it was the same poisonous snake that was curled around my soul. Or maybe it was just a coincidence. At the final ceremony a young hunter offered me a strong brown liquid cupped in his hands. "What's this?" He made a gesture to his nose so I studio 54'd the whole cocktail right up my nose and fell screaming on the bench. "Always" I said tears streaming down my face. Nik was now holding hands with the grandma in the corner. Slowly my pain transformed into a hot tub of high vibratory bliss. "Well I haven't felt this good in years" I felt like I was rolling on drugs but didn't ingest anything except the pound of tobacco I'd Nick Nolte'd up my nose. The jaguar was gone. Nina mysteriously returned*** Don Sabino was resting in the corner. And Drew was apparently pregnant. I buzzed all night and in the morning the cessna had arrived. The grandma packed us a to go banana leaf lunch minus the soup. We were now on a strict Amazonian ceremony dieta of dried unsalted fish and plantains for the next three days. Nik took a strong selfie with her and we were off. “My grandma never walks anyone to the plane” Nina said. “I think she took a liking to you guys"
When we landed back in the uncomfortable world of roads, shopping malls, and power lines, there was an email from Ducati saying there were two new bikes waiting for us in Santiago, Chile. The motorcycle gods had arrived. Book reccommendation : 'One River' by Wade Davis.